Don’t forget to join us at 5:30pm this Friday, November 29th, for our annual Chanukah party and Shabbat/ Chanukah potluck! 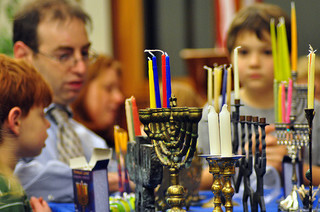 Bring your own chanukiyyah (Chanukah menorah) and candles; we’ll light them all simultaneously in the sanctuary, sing a few Chanukah songs, and then enjoy an evening of Shabbat-and-Chanukah socializing, dreidel-playing, and dining on potato latkes plus whatever else you bring for the (vegetarian / dairy) potluck. As you know, this coming Thursday is not only Thanksgiving day, but also the first day of Chanukah, making it “Thanksgivukkah.” Most people have been saying that this won’t happen again for thousands of years, though my colleague Rabbi David Seidenberg makes a compelling case that it will happen again in 2070. (He also offers a lovely suggestion for blessing our children or grandchildren who will live to see that next Thanksgivukkah.) In any event: it’s going to be a festive day twice over! and sheet music for a one-line grace after meals. I hope that one or all of these will bring extra joy, mindfulness, and gratitude to your Thanksgivukkah table. In Hebrew, the name for Thanksgiving is Yom Hodu, “Day of Gratitude.” (Hoda’ah means gratitude or thankfulness.) But the word hodu also means turkey, the animal which is traditional Thanksgiving fare. So Yom Hodu means both “Day of Gratitude” (or “Thanksgiving Day”) and “Day of Turkey.” May your Yom Hodu contain an abundance of gratitude — and, for those who aren’t vegetarians, an abundance of turkey, too! Here are updates on three matters of CBI scheduling. The remainder of the secular year features a variety of scheduling complications, and our meditation minyan will not be meeting again until 2014. Edited to say: Meditation will begin again on January 3 and will continue onward each week. Thanks to all who attended the first Poetry of Jewish Prayer class at Tunnel City Coffee last month! We found that the coffee shop is uncomfortably loud at that hour of the afternoon. This week’s class will meet at the synagogue, in the library. Tea will be provided. All are welcome. The next newsletter, which will cover the months of January and February, will be sent out (digitally and on paper) in early January. All items, updates, articles, simchas, notices, etc are due by Sunday, January 15. Please send them to rabbibarenblat at gmail by that date. Thank you! Here’s the d’var Torah which I offered yesterday at CBI. Cross-posted to Velveteen Rabbi. At the start of this week’s Torah portion, Vayishlach, Jacob prepares to meet his twin brother Esau. This will be their first meeting since Jacob tricked their father into giving him the oldest son’s blessing. He rises in the night and sends his family on ahead of him, across the river Jabbok. Jabbok: יבק. Jacob: יעקב. The two words are made up of the same letters, though Jacob’s name has an extra letter, a silent ע. Rabbi Yitzchak Ginsburgh teaches that this letter connotes vision. After this encounter, Jacob names the place of the wrestle Peni’el, “the Face of God,” saying, “For I have seen God face-to-face, and my life is spared.” In the Biblical understanding, no one can look upon God’s infinity and live. Jacob has seen only a face of God, a facet of God, a refraction or reflection of God in the person of the angel with whom he wrestled. “Only” a face of God? How remarkable it would be if we could see the face of God in every being we meet. Here is the prayer and the Rabbi’s Report which I offered at last night’s Annual Meeting. as we convene this congregation’s annual meeting. in the faces of everyone present tonight. who helped us reach this moment. to the future we will create here together. bring us closer to our ideals of holy community. And let us say together: amen. In this week’s Torah portion, Jacob camps a night alone by the river Jabbok. A mysterious stranger — according to our tradition, an angel — wrestles with him all night until daybreak. In the morning, the angel blesses him: your name will no longer be Jacob, but Israel — Yisra’el, one who Wrestles With God. We hint at this story every time we gather for morning prayer here, as we sing Mah tovu ohalecha ya’akov, mishk’notecha Yisrael: how goodly are your tents, O Jacob, your dwelling-places, O Israel. Most of you have heard me say that it is our task, as we daven here, to transform this beautiful ohel, this beautiful tent, into a mishkan: a dwelling-place for God, a place where God can dwell among and within us. Over the last year, we have often lived up to that ideal. When we have gathered faithfully for Shabbat prayer, and whether we are a crowd of four or a crowd of thirty-five have sung and prayed and rejoiced with fervor. When we have gathered one Sunday a month to prepare hot, nutritious meals for those who would otherwise go hungry. When we’ve fed our own beloved elders during Senior Lunch Bunch. We’ve made this place a holy place when we’ve gathered to watch Mexican Jewish movies and to remember that Jewishness takes many forms in many lands. When we have participated in High Holiday services, Yom Kippur yoga, b’nei mitzvah celebrations and funerals. When we’ve met to talk about Anzia Yezierska’s 1925 classic Bread Givers, or Rebecca Goldstein’s Betraying Spinoza: the Renegade Jew Who Gave Us Modernity. When we have come together to learn about kaddish and minyan and Jewish mourning customs, or to begin delving into the poetry of Jewish prayer. Here’s the secret to making an ohel into a mishkan, a worldly building into a sacred space: what makes the space sacred is our connection to each other, our coming together to sanctify our lives and to offer praise and thanks together, our accompanying each other on the journeys of education and b’nei mitzvah — chuppah and parenthood — grief and mourning. Others can share statistics: how many meals we’ve made for Take and Eat, how many people attended this year’s services during the Days of Awe, how our annual appeal is doing. And let me be clear: all of those numbers are awesome! But for me what’s most awesome, in the original sense of the word, is how we create this community together, and how we connect with holiness when we notice and lift up and love the spark of God in each other. May we go from strength to strength! As news has rolled in about Typhoon Haiyan and the tremendous devastation it has caused, our hearts open to the people of the Philippines with compassion and anguish. There is little that we can do from northern Berkshire except giving money to organizations which are helping survivors there. The URJ Disaster Relief Fund is collecting donations which will be distributed to aid groups working in affected areas. The American Jewish World Service is also collecting donations for Typhoon Haiyan victims. AJWS will distribute that money to local organizations in the Philippines who are already working on the ground there to help survivors. And Medecins Sans Frontieres / Doctors Without Borders has organized teams of doctors, nurses, surgeons, psychologists, water and sanitation experts and other specialists to respond to the typhoon’s aftermath. If you are able to donate, I hope that you will open your hearts and your wallets to the people of the Philippines. The destruction there is almost unimaginable. Our prayers will be with those impacted as they begin to rebuild. D’var Torah for Toldot: Why am I, and how can I integrate? The children grappled with each other inside her, and she thought to herself: if this is so, why do I exist? So she went to ask that of Adonai. If this is so, why do I exist? Or: If this is what’s happening, why am I? The word Rivka uses for “I” is anochi. Usually in Hebrew one uses the simple ani, I. But Rivka uses a kind of royal I, the same word used by God. Rivka takes this question directly to that Anochi, to God, to Yud-Heh-Vav-Heh. That four-letter name can be understood as a form of the verb “to be” in all tenses at once: Was-Is-WillBe. Rivka takes her existential question to the Mystery at the heart of all things.